My friends! – I run with a few guys that are from the PRO team, and I run with the Lapham Peak Trail Runners – great group of people! My heavy speed and strength training is by myself. The Long Run is my favorite; currently reading a book about food. “Miles make Champions.” (a runner, and now a friend, I met during a 50K said this to me…he helped me push through the last few miles of that 50K race to finish as 1st place female). I run because crossing a finish line brings on the BEST high in the world. 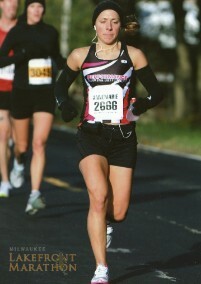 Words cannot describe my best marathon memory….it was simply the Boston Experience. Everyone needs to feel the ‘finish line high’ and achieve their goals. I feed off of others success and like being a part of someone’s accomplishments. This pace group will qualify MANY runners for the Boston Marathon. And we also will have fun…the time will fly by! It’s your race. Stay committed to your marathon goal. I volunteer at different running events during the year; I am a Dirty Girl athlete blogging for the event; I have coached high school tennis and youth soccer; I help teach high school students sports nutrition.